The former editor of a regional Sunday newspaper is set to stand in a mayoral election. Steve Lowe, previously in charge of Bedfordshire on Sunday, will campaign as an Independent candidate in the Bedford Borough mayoral election, which is set to be held in May. Steve, pictured below, has previous political experience having served as a county councillor between 1982 and 1989. Bedford has been run by a directly elected mayor since 2002. Steve, 63, said: “I have been asked by quite a few people if I would stand and have decided to have a go. “I think there is a lot to do. Many of us want a council that listens to the views and responds to the needs of everyone who lives and works in the borough. 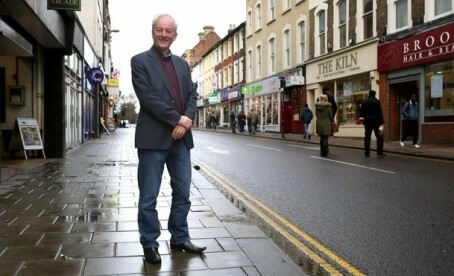 “I want to tackle issues such as education, housing and improving the look and feel of Bedford. As well as serving as a counrty councillor, Steve was also previously secretary of the local anti-apartheid group and met international campaigner Bishop Trevor Huddleston. After finding out he was born in the town Steve was part of a local group which worked to have a bust of him installed there, resulting in a visit by Nelson Mandela to the town in 2000. Good luck. But from 30 odd (very odd!) Years of covering councils independents have a tough time effecting change. Pity, because politics spoils local government.